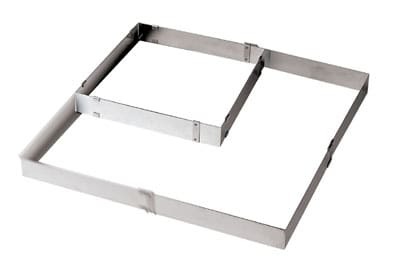 The Paderno 47526-05 square frame extender is made of stainless steel to resist corrosion and dents. When used with baking sheets, it raises the height of pastries. On its own, the frame can help layer dishes and desserts and is adjustable from 117⁄8 inches by 117⁄8 inches to 221⁄2 inches by 22 inches. Adjustable from 117⁄8 in. x 117⁄8 in. to 221⁄2 in. x 22 in.